The increasingly asymmetric and multidimensional nature of threats facing the continent are at the heart of security concerns in Africa and make the evolving security environment on the continent radically different from what is was a decade ago. Many of these security threats stem from weak and unaccountable governance and the lack of political will to address these challenges. 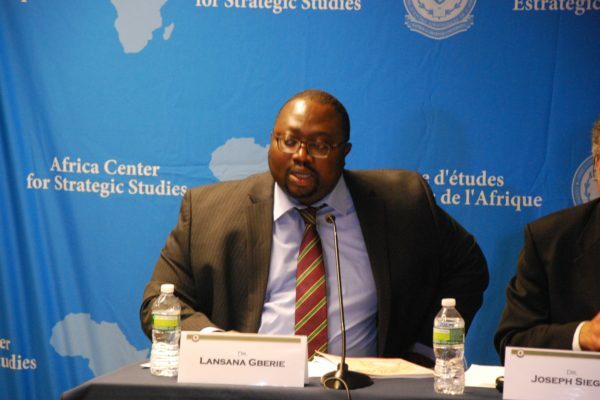 These are some of the highlights discussed at an experts roundtable discussion on July 29, 2014, at the Africa Center for Strategic Studies (ACSS). 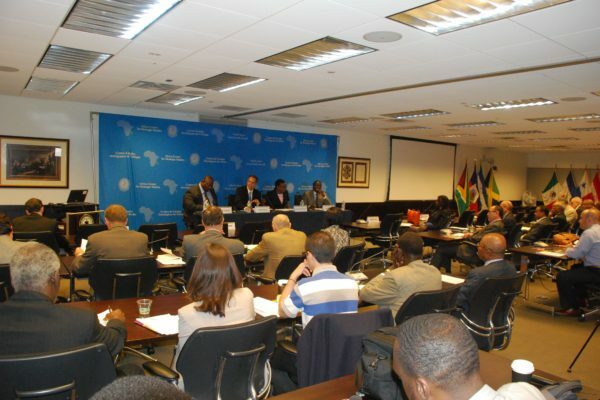 The seminar, titled “Africa’s Security and the United States: Converging Interests and Expanding Partnerships,” sought to assess perspectives from the continent and implications for future U.S.–Africa security cooperation ahead of the first ever U.S.–Africa Leaders’ Summit to be hosted by U.S. President Barack Obama at the White House on August 4–6, 2014. 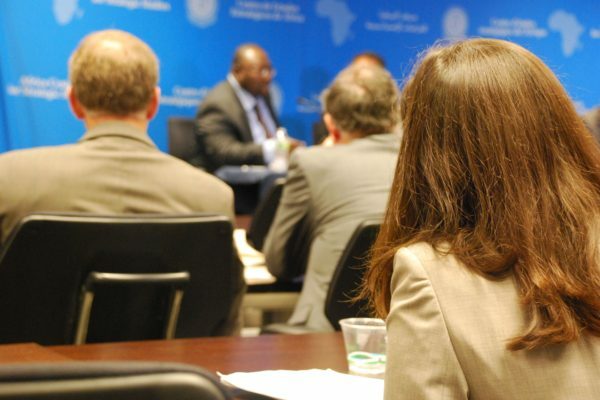 The roundtable brought together about 120 participants across the U.S. government and military, local and foreign media, policy research institutes, and members of the African diplomatic corps. A panel of African specialists discussed a range of security issues and identified areas for future collaboration between Africa and the United States. Commander Loïc Moudouma, the focal point on Maritime Safety and Security at the Gabonese Ministry of Defense as well as the expert on Maritime Safety, Strategy and Force Planning with the Central Africa Multinational Forces of the Economic Community of Central African States (ECCAS) gave an overview of Africa’s maritime challenges. He identified three challenges: First, the maritime domain is not fully appreciated as a major contributor to the regional economy in West and Central Africa. As a consequence, the cost of the loss of key revenues from such activities as piracy or illegal fishing are neither fully understood nor planned for by decision-makers. Second, African maritime safety and security assets are grossly inadequate, and in some cases non-existent. And third, the employment of such assets where they are available are not aligned with economic or national security policies. Commander Moudouma emphasized the importance of political will and sustained funding strategies for maritime security. Key missions in the African maritime domain include countering illegal fishing, combating narco-trafficking and piracy, and disaster response. These missions require “hybrid” forces combining the traditional naval functions with those of a coast guard. They also require cross-domain and interagency planning. “Illicit transnational activities begin on land, extend to the water, and return to land … therefore cross-domain awareness and functionality are vital,” he suggested to participants. U.S. support to African countries should center on raising the profile of maritime security issues at the ministerial level and above, assistance to better analyze the threats, and training. These needs, however, must support African structures, which in turn must be based on strong political will, improved awareness, and prioritization. “We must change the way we think about our maritime environment, develop an appropriate policy framework, identify missions and then develop capabilities,” the Commander advised. “American support must match serious efforts on our part to address problems … the U.S. support for the West African regional maritime security policy is but one example of how this can be achieved in practice,” he concluded. Dr. Lansana Gberie, lead coordinator and researcher with the West African Commission on Drugs (WACD) and member of the United Nations Security Council Panel of Experts on Liberia discussed the findings and policy implications of WACD’s report in the context of emerging security challenges in West Africa. The report raises three policy issues: First, Africa is a fast growing hub for global traffickers; second, trafficking is undermining the integrity of African states that are already fragile and, in the process, weakening their ability to provide security; third, comprehensive public health interventions as part of an overall response strategy are severely lacking. These issues directly affect U.S. security policy in Africa as well as broader U.S.–Africa defense and security cooperation activities. Of particular concern is the potential use by terrorist organizations of narco-trafficking infrastructure and revenues. Conversely, narco-traffickers might potentially use terrorist infrastructures to move people, drugs and weapons. An integrated response relying on several instruments of state power – law enforcement, military, intelligence, and informational among others – is therefore required. Dr. Gberie emphasized the importance of close coordination between the United States and partner countries on the continent. In fact, it was a result of the careful documentation by U.S. agencies involved in prosecuting several African narcotics trafficking cases that has provided the most extensive analysis of how these trafficking networks are operating. developing comprehensive strategies to address producer, consumer and transit country needs as well as sharing of experiences. 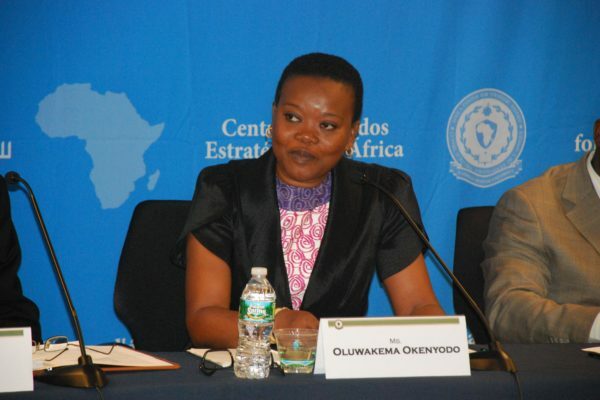 Ms. Okenyodo suggested that Nigeria’s national security challenges needed to be understood by Nigerian actors and their American partners as symptomatic of a much deeper, structural problem centering on systemic governance failures, growing income and structural inequalities, lack of equitable service provision and embedded sectarian practices. Ms. Okenyodo argued that Nigeria’s lack of a truly unifying national identity makes the country highly vulnerable to violence, often reflecting deep socio-economic cleavages especially between the north and south. “These dichotomies tend to shape the political process and lend themselves to exploitation by politicians, military leaders and terrorist groups including Boko Haram and the Movement for the Emancipation of the Niger Delta (MEND),” she told participants. The discussion also highlighted Nigeria’s youth bulge, one of the highest in Africa. Ms. Okenyodo warned of the dangers ahead. “The security forces, political parties, terrorist groups and drug traffickers all recruit from the same youth demographic in Nigeria,” she cautioned. “This particular sector of the Nigerian population can strategically shift the momentum either towards peaceful or violent ends … therefore Nigerian and American partners should pay very close attention to this demographic in their ongoing bilateral relationship.” Specifically, U.S. assistance in developing communications strategies that can effectively reach these youth would be highly valued. The upcoming U.S.–Africa Leaders’ Summit, the first of its kind, is expected to strengthen U.S.–Africa relations. Discussions will center on how to encourage progress in key areas that Africans define as critical for the future of the continent: expanding trade and investment ties, engaging young African leaders, promoting inclusive sustainable development, expanding cooperation on peace and security, and gaining a better future for Africa’s next generation.